Driving through seven countries in five days and in a car that has seen better days. That’s the task facing Greenbank Hotel general manager Ben Young together with a group of other intrepid explorers this autumn. 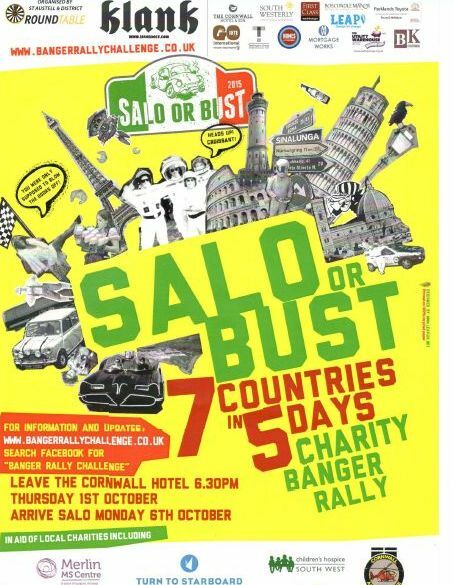 Young is taking part in the St Austell and District Round Table-organised 2015 Charity Banger Rally Challenge. The rally will leave the Cornwall Hotel on Thursday, October 1, and finish five days later in Salo, Italy. The one proviso drivers have been given on entering the rally, is that their car cost no more than £350. Teams are invited to raise money for six main charities Cornwall Hospice Care, Turn to Starboard, Marie Curie, Cornwall Air Ambulance, Merlin Project and Children’s Hospice Southwest. To pledge your support for Young’s chosen charity, click here.